WILLIAMSBURG — A new mobile photo franchise is making its way to greater Williamsburg, capturing audiences by combining the concept of selfies with savvy computer graphics, touch screen technology and social media sharing. "It's a cutting-edge technology that's blowing the old-fashioned photo booth out of the water," said Donna Drew, owner of TapSnap1105. She and her husband, Mark, a retired disabled veteran, opened the business this summer, serving south Hampton Roads, Williamsburg, and the Peninsula. "People love it. They go crazy," she said. Armed with a 42-inch touch screen monitor, green screen, camera, and an assortment of special effects and props, the Drews bring their business to the customer. From weddings and birthday parties to charity and corporate events, TapSnap offers a novel way to capture and share the event. Without the walls of the typical photo booth, up to 20 people can be included in one shot. Along with instantly uploading pictures to Facebook, TapSnap also provides 4x6 prints of each of the pictures as part of the rental package, which has a base price of about $350 an hour, depending on customization. Donna Drew, of Chesapeake, said in a phone interview that the social media service is one of her favorite aspects of her business. "Say you're having a wedding and 'Aunt Betty' can't attend. She can watch photos upload to Facebook throughout the event. Then she can still enjoy it and not miss everything." 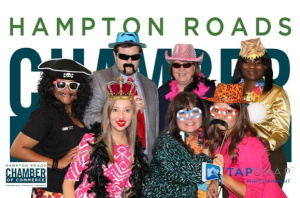 Alisa Crider, communications coordinator for the Hampton Roads Chamber of Commerce, said the organization saw an uptick in its social media engagement after using TapSnap. She called the service "a fresh, innovative way to connect with our members and a real departure from things we have done in the past." Aside from the instant posting to Facebook, Drew's other favorite part of the business is watching people have fun, which makes her job all the more enjoyable. Her husband agrees. "This is a great opportunity for my wife and I to work together doing something we enjoy," said Mark Drew. "We have our own set of skills that compliment each other and make the business run smoothly." Source: Lawson, Robin. "High-tech photo booth coming to Williamsburg." The Virginia Gazette, September 30 2014.